The much anticipated Facebook mobile application has finally been released. After months of speculation (and leaking information) the app became available on mobile platforms including Android and iOS. Previous to the official Facebook application, the iPad and iPhone featured “Friendly for Facebook”, developed by Oecoway, Inc., and MyPad, and developed by Loytr, Inc. The official release does lack flash, a key component to running Facebook games. Since Apple products including the iPad and iPhone lack flash capabilities, when a game or Facebook app is launched, the user is redirected to the mobile version of that app. If not installed, users are prompted to go to the Apple App Store. For example, if a user wants to play “Words With Friends”, they must then open that app on their device. Photos are optimized to take full use of the retina display featured on Apple devices. One significant issue stands out: Facebook credits cannot be used in the app, if a user wants to purchase credits; they have to buy credits through the Apple App Store. It is not disclosed whether or not Facebook retains a percentage of these profits. This marks an on-going debate in which Facebook and Apple have been going back and forth over the use of currency for the social media company since they began discussions of the development of this app for Apple products. It seems Apple won that argument. WebiMax is the leader in SEO services. A veteran in the industry, they have established themselves as the “go-to” firm with their uncompromising commitment to quality and results. 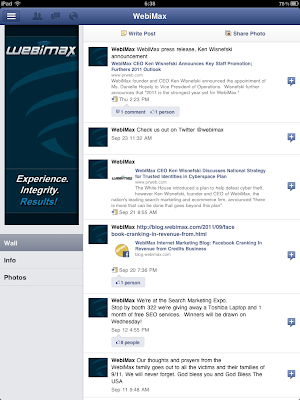 WebiMax has also distinguished themselves as the leading social media marketing firm. ← Google CEO "We can do a better job describing our changes"